The cheerleader of every Bucs fan’s dreams, Rachel Watson, and her lovely daughter, were introduced to Joe this morning at Bucs training camp. Joe’s week is complete. Devoted Joe readers might get quite a smile out of this one. Joe sure did. This is a day at Bucs training camp that Joe will not soon forget. Today at One Buc Palace, one of the all-time greats, Bucs icon Rachel Watson, was introduced to Joe. What can Joe say? How cool was Rachel to tell Joe that she regularly reads JoeBucsFan.com and has no problem with Joe often referencing fantasies of her someday knocking on Joe’s door in the wee hours for unbridled pleasure. It was odd. A representative of the Bucs media relations staff approached Joe, who was seated watching the final minutes of Bucs practice. 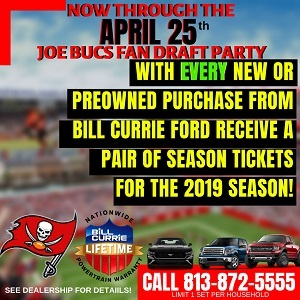 “Joe, we have a celebrity here we think you would want to meet.” There were two women, one was Bucs cheerleader coach, Catherine Boyd. The second woman was carrying a child and even while wearing aviator sunglasses seemed stunning. “You should know me,” Rachel said to Joe, or something along those lines. Joe didn’t recognize Rachel until she shed the shades. Joe busted up laughing, as did Rachel, but it seemed no one got more of a reaction to this epic encounter than Woody Cummings of The Tampa Tribune, who nearly fell to his knees he guffawed so much. Joe told Rachel he hoped he didn’t embarrass her much with his constant references to her. Rachel laughed, admitting she often reads Joe’s musings and genuinely seemed to get a kick of being a celebrity on this site. And if you must know, yes, although much shorter than Joe envisioned, Rachel is just as ravishing in person as she is in front of the camera. Good for you Joe! You’re a lucky man. ravishing is right ! what a smile that girl has !! LMAO!! I suprised joe didnt get to his knees and bow down to her. Made your week complete? How about your year! I’m surprised she didn’t slap you with a restraining order. Lol. hope you managed to keep it together Joe? Now that IS funny! Glad for ya Joe! LOL! Dang! Now Joe done forgot what we seen today.My Bucs insider done got Rachel wasted. Lmao! Who’s the father of the baby? The Bitter Beer Face guy? WOW. That’s freaking awesome! Post of the year. There you go, Joe. Rachel did finally come knockin’. … Amazing!!!! RCummingsTrib Highlight of Bucs training camp today was when JoeBucsFan met former Bucs cheerleader Rachel Watson. What a moment. Go Joe!!!! You must have enjoyed that!!!! Great for you Joe! I would kill for that moment you had with her haha that’s good stuff. Not only is she just gorgeous, her personality seems just sweet and amazing! My kind of classy lady! did ya get those digits? Nothing like a girl with a sense of humor. 🙂 That’s great to know that she wasn’t filling out paperwork for a restraining order. That’s great to know that she wasn’t filling out paperwork for a restraining order. That’s the very FIRST thing Joe thought of, or that Rachel was going to slap Joe! The Hooters girls look better…Joe you are behaving like Raheem did going 10-6. I have seen much better. Nice story, but you had plausible deniability, you could have ducked the first punch and claimed it was the other Joe that made you do it. The 2nd best thing about this time of the year is there’s football!! The best thing is lovely cheerleaders like Rachel!! Holla at Rachel for us joe! Hehe…. That is Funny! I never thought to think that she might be reading your comments.She is beautiful! Any blushing going on? @marcus – You’re a RHS grad too? She was the best part of high school haha. Her and Erin Verdel. You should ask her out for dinner Joe! Then go to a good concert or something. Hey is it just me or does Rachel’s little girl have Joe’s eyes? Joe, I’m really happy for you. Dreams do come true. She looks better than ever. Ask her to do some Bucs’ reporting for you (VLOGS). I bet she will, if you pay her enough. My dream gal is Sarah Gellar. I think we’ll be reading comments on Rachael for the whole season now, lol. Her cover photo on Pewter Report still hangs on my wall. Hottest Buccaneer cheerleader EVER!